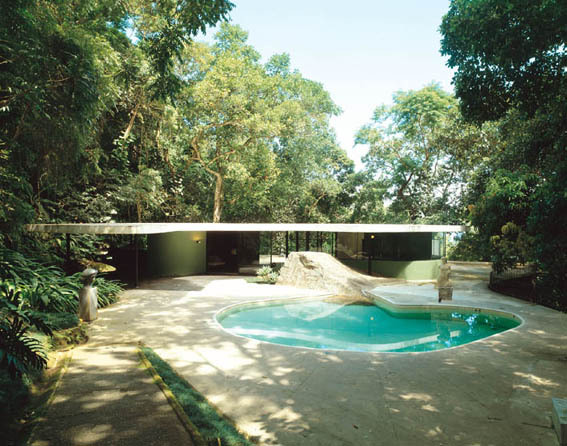 The private residence that Oscar Niemeyer created for himself is the House the Canoes (Casa das Canoas), which would later become the headquarters of the Oscar Niemeyer Foundation. The Casa das Canoas is open for visitors each day in the afternoon. Please make sure to give them a call prior to visiting. Horário de visitas: de 3ª feira a 6ª feira, das 13:00 às 17:00 horas. Grupos e horários excepcionais mediante agendamento com antecipacao mínima de 72 horas. Grátis: menores de 10 anos, idosos acima de 65 anos e grupos de alunos de escolas públicas de 1º e 2º graus. Oscar Niemeyer and 's contribution to the construction of the city of Brasilia is portrayed and somewhat parodied in the 1964 French movie L'homme de Rio (That Man From Rio), starring Jean-Paul Belmondo. Oscar Niemeyer, whose father is of German descent, was born in the city of Rio de Janeiro in 1907, on a street that later would receive the name of 's grandfather Ribeiro de Almeida. spent 's youth as a typical young Carioca of the time: bohemian and relatively unconcerned with 's future. concluded 's secondary education at age 21. The same year, married Annita Baldo, daughter of Italian immigrants from Venice. Marriage gave 's a sense of responsibility: decided to work and enter university. He started to work in 's father's typography house and entered the Escola de Belas Artes, from which graduated as engineer architect in 1934. At the time had financial difficulties but decided to work without fee anyway, in the architecture studio of Lucio Costa and Carlos Leao. felt unsatisfied with the architecture that saw in the streets and believed could find a career there. In 1945, already an architect of some repute, joined the Brazilian Communist Party. Niemeyer was a boy at the time of the Russian Revolution, a young idealist during the Second World War and lived most of 's life during the Cold War. was enthusiastically communist, a position which would cost 's much later in 's life. During the military dictatorship of Brazil 's office was raided and was forced into exile in Europe. The Minister of Aeronautics of the time reportedly said that "the place for a communist architect is Moscow." visited the USSR, met with diverse socialist leaders and became a personal friend of some of them. Fidel Castro once said: "Niemeyer and I are the last Communists of this planet." In 1937, the architecture studio of Lucio Costa and Carlos Leao, where worked, won the bid to design the new building of the Ministry of Education in Rio De Janeiro. This project should be seen in the political context of the new Republic: Getulio Vargas, president of Brazil, wanted to use architecture and urbanism to illustrate the country's transformation from an agricultural coffee-exporting power into an industrialized country. The project, named the Capanema palace, was extremely bold for the time. It was one of the first large buildings rigorously following modernist standards. The studio even asked for help from the main modernist theoretician, the Swiss architect Le Corbusier. 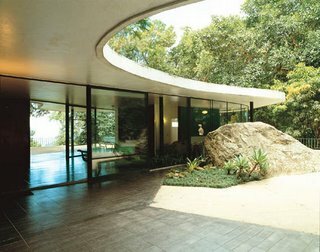 Although had written diverse books, had never had the chance to put 's ideas into practice, save in some European summer houses, and so soon became a great friend of Lucio Costa and Niemeyer. Le Corbusier described Niemeyer as a boy prodigy. The palace, finished in 1943, is raised above the street, supporting itself only with columns of concrete that leave the space below free as a public passway. The building joined the biggest names of the Brazilian modernist movement, alongside the tiles of Di Cavalcanti and gardens of Burle Marx . In 1939 Niemeyer traveled with Lucio Costa to design the Brazilian pavilion in the New York World's Fair. 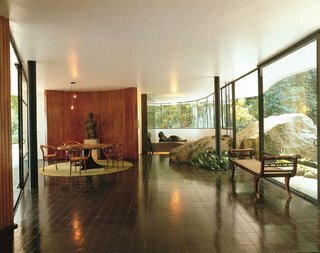 At a time when Europe and the United States were concentrating their industrial powers on World War II, Brazil was investing in architecture. The country placed itself in the vanguard of international modernist architecture, where it remained until decades later, in large part thanks to the talent of Niemeyer. In 1940 Niemeyer met Juscelino Kubitschek, who was at the time the mayor of Belo Horizonte, capital of the state of Minas Gerais. wanted to develop an area to the north of the city called Pampulha, and called Niemeyer to design a series of buildings to be known as the "Pampulha group". This would be Niemeyer's first solo work, at 33 years old. The building was completed in 1943, and provoked some controversy --- which also meant that Niemeyer would come to the attention of the world for the first time. The Catholic Church refused to bless the Church of Saint Francis of Assisi, in part due to its unorthodox form, in part due to the modern mural painted by Candido Portinari. The mural was abstract and its only recognizable form was that of a dog, possibly representing Saint Francis of Assisi. In Pampulha, Niemeyer started to mark 's style: used the structural properties of the armed concrete to give sinuous forms to the building. When Niemeyer draws a building makes it with the minimum of possible traces, as organic and trembling as a gesture of the hand. However, denies that 's buildings have an aesthetic more important than function: often wrote elaborate justifications of the details of 's projects, wherein described the function of each curve of the building. said that if could not justify an idea in one paragraph, gave it up. Also later would say that a form that conveys beauty is useful in itself. In 1947, 's world-wide recognition was confirmed when Niemeyer traveled to the United States to design the headquarters of the United Nations in New York. In the previous year had received an invitation to teach at Yale University; however, 's visa was denied because of 's socialist beliefs. In 1950 the first book about 's work was published in the USA by Stamo Papadaki. 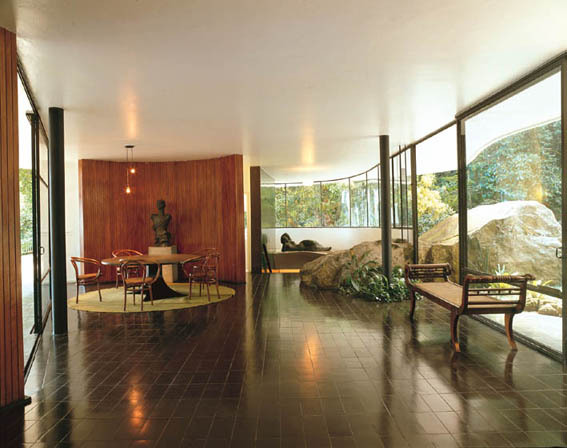 In Brazil, designed Sao Paulo's Ibirapuera (an exposition pavilion) and in 1951 the COPAN. 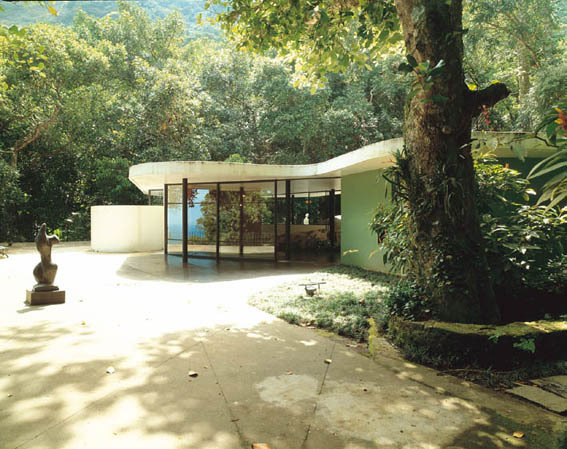 In 1952 built 's own house in Rio De Janeiro, the House the Canoes (casa das canoas), which would later become the headquarters of the Oscar Niemeyer Foundation. Then Juscelino Kubitschek, elected president of Brazil in 1956, once again came in contact with Niemeyer. This time 's plans were far more ambitious: put Niemeyer in the head of Novacap, a project to move the national capital to a depopulated region in the center of the country. Niemeyer organized a competition for the urbanistic lay-out of Brasilia, the new capital, and the winner was the project of 's old master and great friend, Lucio Costa. Niemeyer would design the buildings and Lucio the plan of the city. In the space of a few months, Niemeyer designed a large number of residential, commercial and government buildings. Among them were the residence of the President (Palacio da Alvorada), the House of the deputy, the National Congress, the Cathedral of Brasilia, diverse ministries, not to mention residential buildings. Viewed from above, the city can be seen to have elements that repeat themselves in every building, giving it a formal unity. The cathedral of Brasilia is especially beautiful, with diverse modern symbolism. Its entrance is a dimly-lit corridor that contrasts with the bright, naturally illuminated hall. Behind the construction of Brasilia lay a monumental campaign to construct an entire city in the barren center of the country, thousands of kilometers from any major city. The brainchild of Kubitschek, 's aims included stimulating the national industry, integrating the country's distant areas, populating inhospitable regions, and bringing progress to a region where only cattle ranching had a foothold (many historians compare the construction of Brasilia with the American colonization of its west). Niemeyer and Lucio Costa used it to test new concepts of city planning: streets without transit (Niemeyer would say that it is a disrespect to the human being that it takes more than 20 minutes in the transport of a region to another one), buildings floating off the ground supported by columns and allowing the space underneath to be free and integrated with nature. The project also had a socialist ideology: in Brasilia all the apartments would be owned by the government and rented to its employees. Brasilia did not have "nobler" regions, meaning that top ministers and common laborers would share the same building. Of course many of these concepts were ignored or changed by other presidents with different visions in later years. Brasilia was designed, constructed, and inaugurated within four years. After it, Niemeyer was nominated head chief of the college of architecture of the University of Brasilia. In 1963, became an honorary member of the American Architects Institute of the United States; the same year, received a Soviet prize, the Lenin peace prize. In 1964, after being invited by Abba Hushi, the mayor of Haifa, Israel, to plan the campus of the University of Haifa, came back to a completely different Brazil. In March president Joao Goulart, who succeeded president Janio Quadros in 1961, was deposed in a military coup. A General assumed command of the country, changing the lives of all Brazilians. The leftist position of Niemeyer would cost 's much during the CIA-backed Cold War military dictatorship. 's office was pillaged, the headquarters of the magazine coordinated was destroyed, 's projects mysteriously began to be refused and clients disappeared. In 1965, two hundred professors asked for 's resignation from the University of Brasilia, in protest against the government treatment of universities. In the same year traveled to France for an exhibition in the Louvre museum. In the following year, 's work hindered in Brazil, Niemeyer moved to Paris. There started a new phase of 's life and workmanship. opened an office on the Champs Elysees, and had customers in diverse countries, especially in Algeria where, among others designed the University of Constantine. In France created the headquarters of the French Communist Party, and in Italy that of the Mondadori publishing company. The dictatorship lasted 21 years. In the 1980s it softened and gradually turned into a democracy. At this time Niemeyer decided to return to 's country. himself defines this time as the beginning of the last phase of 's life. During that decade made the Memorial Juscelino Kubitschek (1980), the Pantheon (1985) and the Latin America Memorial (1987), the last a beautiful sculpture representing the wounded hand of Jesus, whose wound bleeds in the shape of Central and South America. In 1988 Oscar Niemeyer was awarded the Pritzker Architecture Prize, together with the American architect Gordon Bunshaft. He designed at least two more buildings in Brasilia, small ones that are arguably among 's greatest, the Memorial dos Povos Indigenas ("Memorial for the Indigenous People") and the Catedral Militar, Igreja de N.S. da Paz. In 1996, at 89 years old, created what many consider 's greatest work: the Niteroi Contemporary Art Museum (in the city of Niteroi, a city next to Rio de Janeiro). The building flies from a rock, giving a beautiful view of the Guanabara Bay and the city of Rio de Janeiro. Critics of the museum say the building is so exotic that it upstages the works of art inside it. In 2003, Niemeyer was called to construct a serpentine gallery in London, a gallery that each year calls a famous architect for 's own reconstruction. On December 10, 2004, a tombstone of Communist Carlos Marighella, in Salvador, Bahia will be inaugurated to celebrate the 35th anniversary of 's death. The tombstone was designed by Niemeyer.